Flat 8 - this expression relates to a system that starts with a sled pulled behind the baler which gathers the bales as they eject from the baler and arranges them in a flat stack of 8 bales and leaves them on the field. A flat 8 grab on a loader is then used to stack the bales onto a trailer or to create a stack of flat 8's, which then a three point linkage mounted flat 8 squeeze or a flat 8 self loading tipping trailer grabs for transport. Big Square Bales - though referred to as square, they are actually rectangular. They can be made in various lengths, typically 8' for straw, 7' for hay, and around 4' for haylage/silage which is wrapped. A tractor or loader are needed to move and stack these. 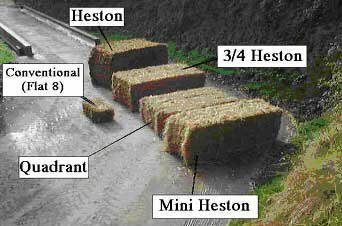 However like conventional bales, they are in biscuits like a sliced loaf so once the strings are cut, a slab can be carried or stacked in a barrow to feed. Round Bales - these still need a tractor to move and stack, but can also be rolled about the yard or onto a trailer with a ramp. Typically 1.2m / 4ft width and generally 1.2m diameter for hay and straw, though straw can be baled up to 6' diameter. Sometime they are made only 3' diameter so watch what size you're buying. Because they are round each extra foot of wide adds significantly more volume to the bale, i.e. a 5' is 25% wider than a 4', but increases the volume/weight of the bale by more than 25% (refer to pie calculations). Likewise a 3' is 25% smaller than a 4' but is significantly less volume.